We were absolutely delighted to find an email in our inbox recently from a knitter named Amanda who just recently finished her KAL sweater. What a fantastic surprise that was! 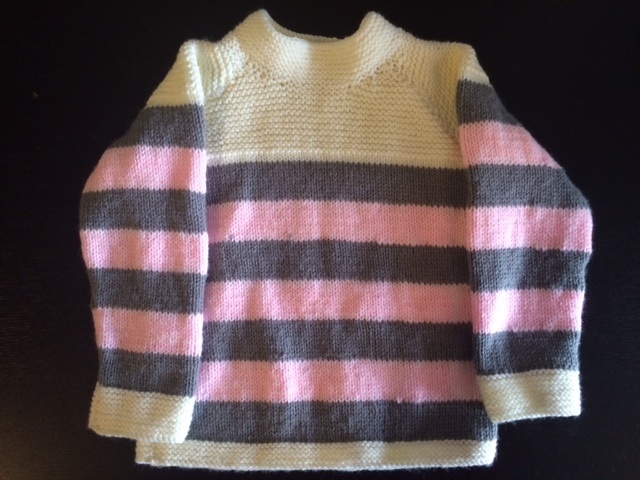 The colours she chose are so sweet, her workmanship impeccible, and to top it all off… it’s her first sweater! Congratulations on a sweater well done Amanda! You should be so incredibly proud of this! Whoever ends up wearing this is one very lucky little person! And to the rest of you who may still be knitting away on your KAL sweaters (we know you’re out there…) Don’t be shy! Make sure that you send us some photos of your finished sweater to lynn@estelledesigns.ca or marsha@estelleyarns.com. Seeing other knitter’s finished projects is such an inspiring thing for yarn lovers like us, so don’t be shy! It is food for our soul.